Flybe's woes continue with the company issuing a full-year profit warning this morning in a trading update ahead of its results for the first six months of 2018. A full-year tax loss of £12 million is now anticipated which follows a £19.2 million loss in 2017. Flybe attributes the situation to higher fuel prices, the lower value of sterling and weaker customer demand. The airline is reviewing further capacity and cost-saving measures along with its current strategy which sees it concentrating on its most popular routes. This has seen passenger seat revenue increase by around 8% but yield was down by 2%. The profit warning saw over a third of the company's value wiped off this morning with shares now trading around 20 pence. 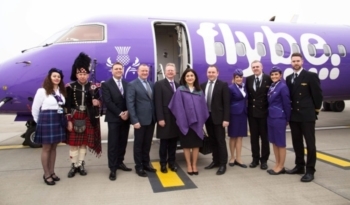 Since Flybe floated on the stock market at 295 pence per share in 2010 the story has been one of an almost continuous reduction in the company's value. I've been reading the financial press this morning and there is now a body of opinion that cannot see Flybe continuing in its present form for much longer. The CEO is naturally making optimistic noises - she can't do anything else - but the airline has tried to become all sorts of things since its flotation, none of which has so far worked. It might be with the share price now so low that someone will be interested in purchasing the airline and will invest some capital. It's hard to see another airline being interested because I can't think of one where a synergy exists, although Stobart might be tempted if they can buy Flybe dirt cheap. But would they want to? Nice and cheap for a stobart buy out. They were interested before and I can’t see the anount of debt that flybe own having increased that much in the last few months..
Idk about a Stobart buyout happening now. They are ending the franchise in 2020 and the Southend operations cost them a lot of money so that may put them off going further into the airline business in buying Flybe. Further declines in the share price so far this week, closing at 12.15 pence per share yesterday and today down a further -10.49% at 10.88 pence per share. Wonder if there will be a reaction from the board now? The share price closed today down -5.57% at 10.25 pence per share. It's by an aviation analyst that's estimated the profitability based on fare price over the past 12 months up to September. CWL is subsidised, so is it an accurate estimate? DSA, also subsidised, is missing. I'm surprised MAN is rated as poor tbh. Also if they are including SEN are they also including Easterns routes as well? I'm surprised MAN is rated as poor tbh. I'm not that surprised, given their battle with Loganair over MAN-Scotland. It's obviously simplistic to judge a company's health by its prices to its customers although they undoubtedly play a part. Of the 22 'bases' 12 are judged marginal or poor, 9 excellent or good and one (Southend) heavy loss. On that score only 41% of them are contributing significantly to the company's cash flow, although we don't know the individual deals with the airports which, at least in some cases, will provide different slant on ths subject. It would be very interesting to see 'control samples' from other airlines by this measure. The Flybe credit card has been dropped. Has the curse of Head for Points struck again?! At a credit card conference in February I explained why – from the point of view of the issuer – the Hilton Honors Visa card had the worst balance between sign-up bonus and long-term rewards of any card on the market. Within a week, Hilton had pulled it. I am assuming it was nothing to do with me! This is actually good news if it means a more rewarding, possibly Avios-driven, Flybe-branded credit card will appear in the future. And should we buy the airline?! Following another dismal trading statement last week, the market capitalisation of Flybe had dropped to just £24m yesterday morning. There is, of course, a lot of debt in there as well which explains the low figure. However, £24m is worrying low. It is a strange state of affairs that, if we had a whip around amongst Head for Points readers, we could buy the airline. We have enough London-based investment bankers, entrepreneurs and hedgies amongst the readership to get the money together! I should probably clarify for the purposes of Stock Exchange rules, since I spent 16 years in my previous life putting together deals like this, that I have no intention of doing so but it simply goes to show what a parlous state the airline is in. Share price closed slightly up today +5.85% at 10.85 pence per share. Good find. I would go along with that but there will be a margin of error. SEN although a Stobart operation has just been dismantled so that matches his synopsis. CWL is still a relatively new base so it's performance will still be up and down. MAN is shown as an under performer, is this down to competition with other carriers? All their eggs in one basket concentrating too much on larger airports? Removing one of the orange bases and cutting under performing routes from some yellow bases could turn those green. All said It's easy to be an armchair critic without knowing the full facts. Just booked LPL-NQY-LPL for my mum end of May/June. So I hope they are still going , paid by credit card , thought safer just in case. A very small drop in the share price today. Down 2.76% to 10.55 pence. With the current state of affairs, a wise move paying by credit card.